The Guardian and Independent are two of the first news sites to build a new breed of Facebook apps, which were unveiled at the f8 conference yesterday (Thursday, 22 September). Here is director of Facebook’s platform partnerships Christian Hernandez explaining how the apps and the new ‘recommend bar’ work. News sites will be watching to see whether the new apps result in a jump in Facebook referrals to the Guardian and the Independent. Outlets will also be keen to discover whether Facebook users prefer the Independent and Yahoo News approach of the social engagement happening on the news sites, or whether the Guardian, the Washington Post and the Daily have the winning formula, with the experience happening within Facebook. The Guardian’s theory is that Facebook users like the experience of being on Facebook so rather than direct readers away, they want them to explore the Guardian within the platform. We wanted to make ourselves more Facebookey. We also know that if people come to the Guardian via Facebook they often bounce back to Facebook see what else a friends are recommending. She said despite the Guardian’s being an app within Facebook it is incorrect to think most users will access it as they would a smartphone app. The starting point is your friend’s timeline, not the app. The single opt-in to the app – where users agree to share everything they are reading – is an interesting development and both the Independent and Guardian have been quick to assure users they have full control. You might be happy for friends to see that you’ve read an article on tarte citron but less comfortable with a public note to say you have read an article called “my husband is a cross-dresser”, so you can quickly click the cross to hide that from your friends. She explained conversations between the Guardian and Facebook took place throughout the summer with the news organisation’s in-house developers building the app, making the most of the open technologies. We’ve got our open API, Facebook has this open graph. The Independent has taken a different approach – its app encourages Facebook user engagement on its site rather than within a user’s personal profile on the social network. This entry was posted in Social media and blogging, Traffic and tagged christian hernandez, Facebook, facebook apps, Independent, Jack Riley, Meg Pickard, The Guardian on September 23, 2011 by Sarah Marshall. As reported by Journalism.co.uk last Tuesday, the Guardian has introduced a new set of blogging and commenting guidelines for its journalists. The eight guidelines offer advice on “best practice” for Guardian journalists and writers when blogging for the site or responding to comments on Guardian.co.uk. For a couple of years now we’ve had a dedicated intranet site (“Really Social Media”) providing training, resources, case studies, best practices and guidelines for digital engagement (covering social media, blogging, commenting and so on), to be used by staff in conjunction with established company policies about internet use. As this is an evolving field, we regularly update the guidelines to reflect best current knowledge and to help staff navigate the changing landscape of sites/services, skills and situations. During the summer, the editorial management team worked on the current refresh, which includes interaction guidelines, as well as legal notes and editorial best practice. When publishing the updated guidelines internally at the Guardian, we thought it would be interesting and appropriate to be transparent with readers about the advice we’re giving to staff members, so we published them on guardian.co.uk as well, as part of our extensive and recently relaunched info section. This entry was posted in Social media and blogging and tagged guardian, Meg Pickard, social media, social media guidelines on October 25, 2010 by Laura Oliver. The Guardian is moving its blogs onto its new platform, bringing them in line with the rest of the recently redesigned site. The move will be completed in two stages starting with 14 titles, including its Lost in Showbiz and news blogs, an announcement on the Inside Guardian blog said. The remaining sites will move over next month. 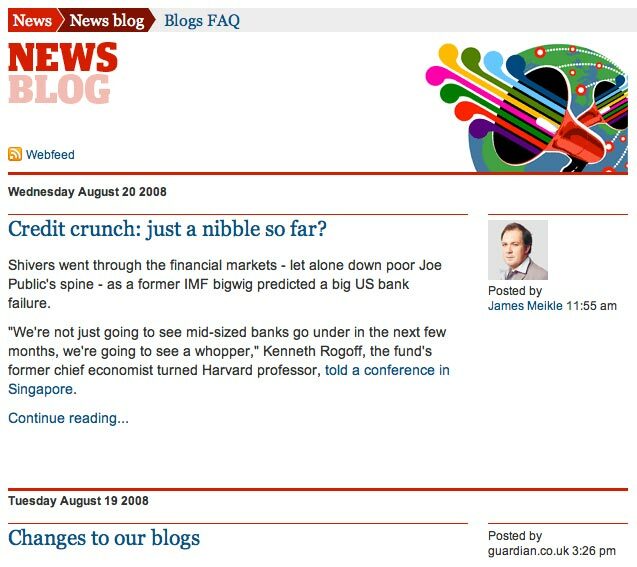 Once switched the blogs will boast new colours and design features (see the right-hand screenshot below), including improved navigation and links to the rest of Guardian.co.uk. Keywords linking blog posts to related content across the site will be added – a feature previously unavailable on the blogs platform. 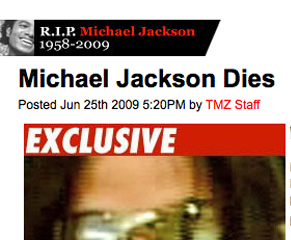 Blogs will also be relocated to their sections – e.g. the politics blog in the politics channel – rather than housed in a separate blogs section. 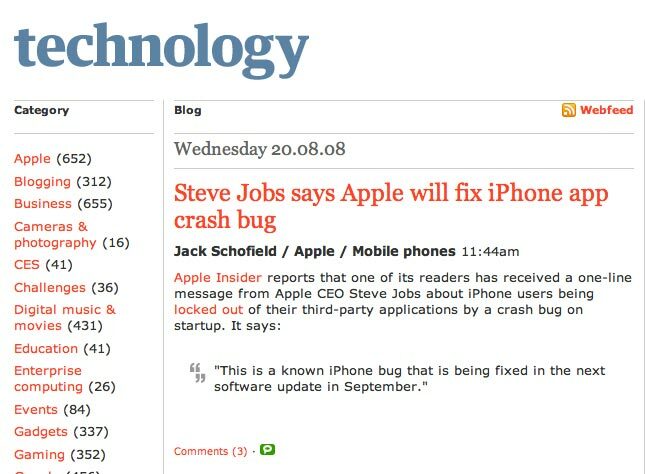 The new blogs will also share features introduced across the rest of the redesigned site, including the option to share posts by Digg, del.icio.us etc, and a widget showing the most-linked to Guardian content. Blog posts will now also be included in the site’s search. Changes to the commenting function on the site’s blogs have also been made – the biggest change being the introduction of user profiles. Additional features will be added to user profiles over time, added Pickard, and experiments with the layout of comments beneath blog posts are ongoing. Basic formatting, such as creating block quotes and links, is also now possible on blog post comments. The new features have previously been trialled on the site’s Comment Is Free platform and use social media firm Pluck’s commenting technology. This entry was posted in Social media and blogging and tagged author, blogs, Guardian.co.uk, head of communities and user experience, launch, Meg Pickard, National newspapers, Pluck, redesigned site, social media, The Guardian on August 20, 2008 by Laura Oliver. The Guardian is advertising for a keyword manager to look after the labelling of its online content and ‘ensure that it is consistent with the needs of the reader and the editorial values of the Guardian and Observer’. As we reported from last week’s AOP conference, Meg Pickard, head of communities at Guardian Unlimited, stressed the growing importance of keywords and said that the Guardian wanted to extend its use of keywords to provide more opportunities for user curation on the site. According to the listing, which Martin Stabe kindly pointed out, the ideal candidate will be a journalist with a particular interest in archiving and a keen editorial sense, who can work across a variety of media. 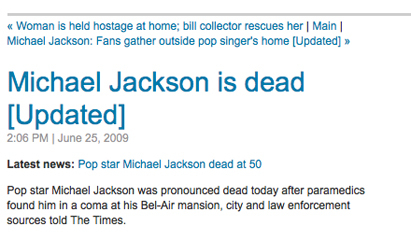 Better still – encourage journalists/editors to incorporate this keywording practice into their daily routine? This entry was posted in Online Journalism and tagged Guardian Unlimited, head of communities, journalist, keyword manager, Martin Stabe, Meg Pickard, online content, The Guardian on October 8, 2007 by Laura Oliver.